The Astronomik CLS CCD is suitable under light-polluted skies for DSLR Cameras, which have been remodeled for astronomical use. The filter enhances the contrast between all deep-sky objects and the background. 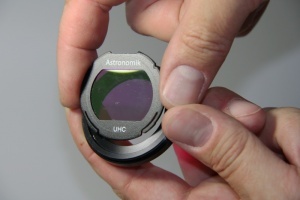 The CLS-CCD Filter enhances the contrast between astronomical objects and the background. Due to the wider transmission curve compared to UHC filters, a greater amount of light will pass the filter. Stars will be less dimmed. This filter has been optimized to block as much spurious light as possible and simultaneously provide the best performance for 'useful' light. A good filter for DSLR-, CCD- and film b/w-photography as well as observation of deep-sky-objects with telescopes or photo lenses of all aperture f/3 and above. 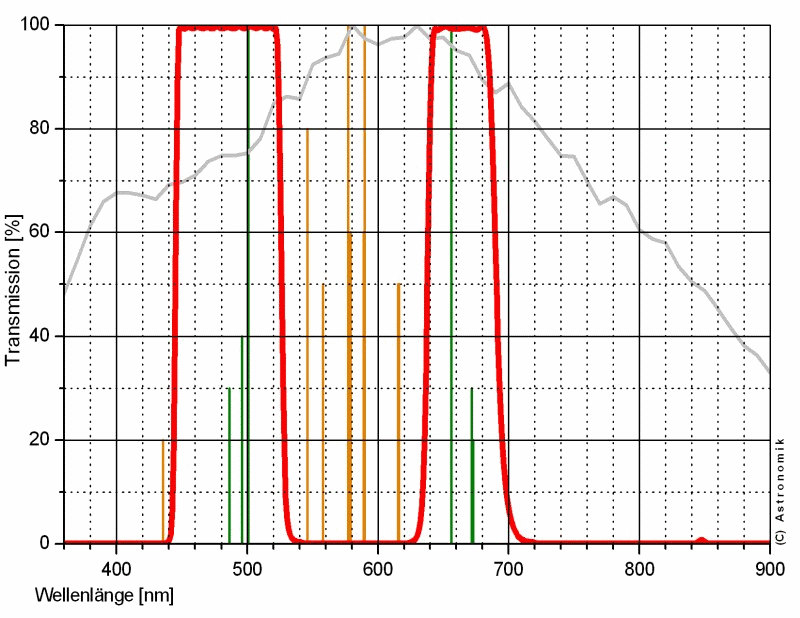 The filter blocks completely emission lines of artificial light sources like streetlights (e.g. sodium- and mercury-vapor) as well as the airglow. All 'important' emission lines as well as the spectral range of the night-adapted eye are beeing passed. The supplementary IR-blocking layer allows the use for DSLR- and Webcams without an integrated IR-block filter. CLS: For cameras with an integrated IR-filter or for visual observation. A small but very useful adaptor. If you have any Astronomik clip filter, this handy adaptor allows you to use these on any 2" eyepiece using the filter thread on the bottom.